The University of Southampton is leading an international project to provide sustainable electricity supplies to rural communities in Africa. The aim of the project is to establish and implement replicable, off-grid electricity generation, based on a solar photovoltaic (PV) storage system, which promotes development in sub-Saharan Africa. 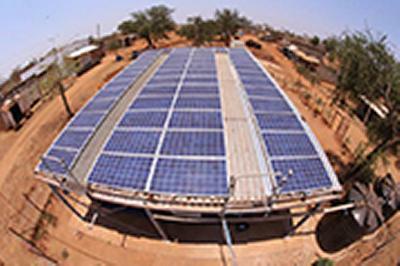 The five-year “Replication of Rural Decentralised off-grid Electricity Generation through Technology and Business Innovation” or Energy for Development (E4D) is a multi-institutional research programme, funded by the Research Councils UK and the UK’s Government Department of International Development. The multi-disciplinary research, which incorporates community and government participation, encompasses social, technical, economic and cultural knowledge generation that allow such projects to be recreated in rural communities across the world. The E4D project will develop a community-based mini-grid solar electrification system aimed at invigorating village trading centres (TC) by providing electricity directly to businesses, which in turn, provide charging for electrical appliances, such as LED lanterns for lighting and for mobile phones, to the rest of the community. This is the concept of the Kitonyoni village market solar project established in 2012 in Makueni County, Kenya. The project displaced the use of candles or kerosene used for lighting within community households and businesses, which is expensive and has negative health effects. By working closely with the villagers, the E4D team established an economically sustainable approach, whereby the community is responsible for the operation and maintenance of the plant. Income is generated for the cooperative, also set-up as an energy supply company (ESCO), through membership fees, local sales of electricity and share ownership. Such income covers all the running costs of the project and provides finances to the community, as well as contributing to the recovery of the capital cost of the project. Together, E4D engineers, local contractors and villagers were able to assemble the containerised 13.5 kWp photovoltaic solar plant and the mini-grid within one week. The premise of the modular project design is to make it easier to replicate and resize to suit villages of different size and requirements. This month, the E4D team celebrates the first year of operation of the project, which has undoubtedly transformed the lives of the villagers. The project is now a beacon in Africa having many local and international visitors including from Japan, Germany, UK, Zambia, the World Bank and other funding agencies. Professor Bahaj comments: “The transformation of trading centres is very clear: land prices have more than doubled, at least five new buildings have been completed, new businesses started, businesses’ income has in most cases more than doubled and most importantly, a new maternity ward is now operational.